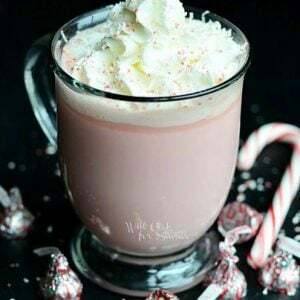 A big mug of Peppermint White Hot Chocolate is a great drink to have in your hands while curled up in front of your fire place or next to your Christmas tree. 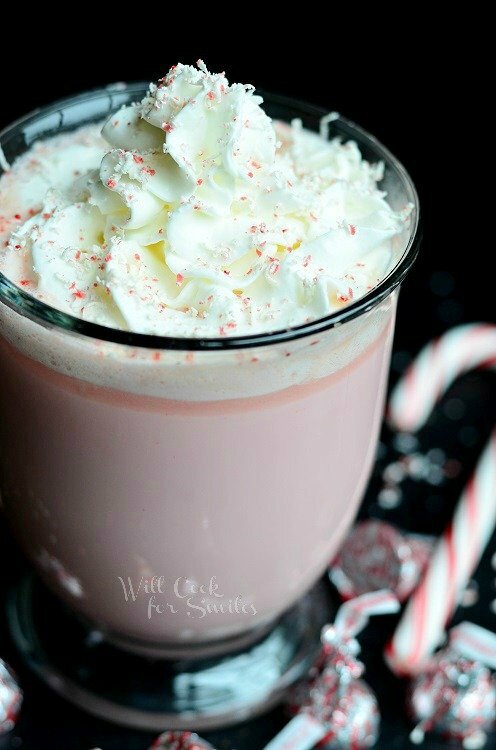 It’s a delicious hot cocoa that’s made with peppermint kisses and white chocolate! I hope it’s hot cocoa weather where you are because it’s 80s here. We’ve had 1 day of winter so far and we missed it because we were away on vacation. Maybe in January we will get another day or two of winter. Thanksgiving came and went, and we are still wearing t-shits. I’ve started decorating for Christmas and had to crank the AC way up to try and get it the holiday mood. 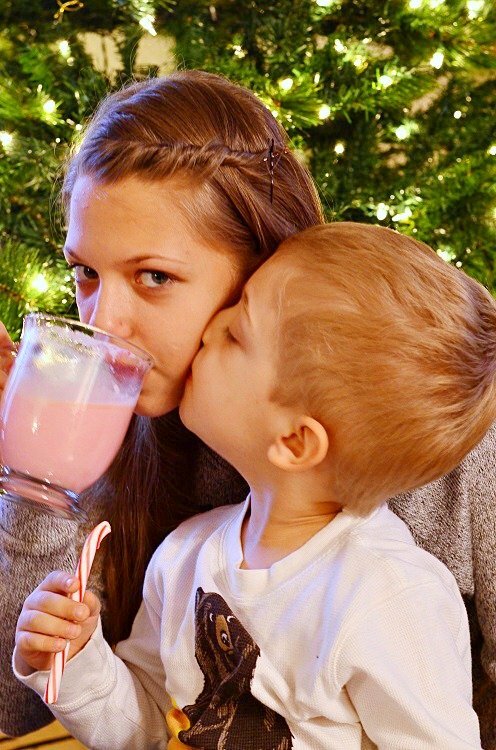 I made some cocoa for kids because nothing puts you in a holiday mood more than Christmas lights and hot chocolate. I wanted to make something new for them instead of the same old cocoa. This is a very simple hot chocolate and combination of peppermint and white chocolate is simply divine. It’s smooth and creamy. 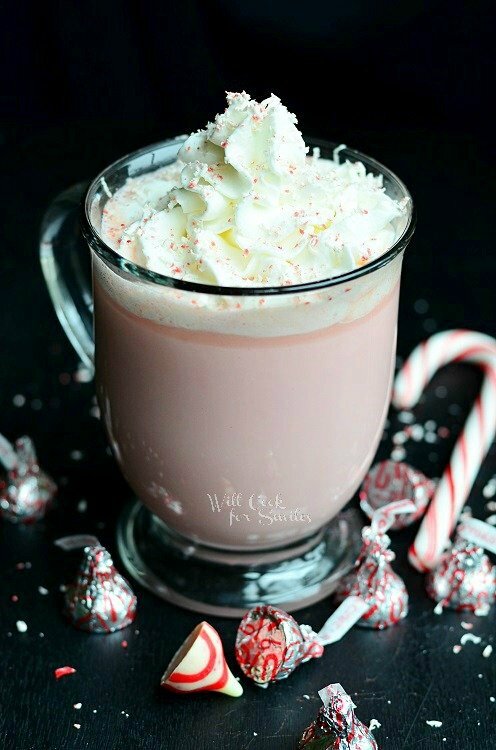 This hot cocoa gets it’s smooth, creamy texture from being cooked with peppermint kisses. You can choose to use whole milk, reduced fat, or even fat free milk. This is a rich holiday drink, so I often use fat free milk. Don’t add any extra sugar because the drink is already quite sweet. Get kids to peel the wrappers off the peppermint kisses. It’s tedious but kids do it super fast and it’s fun for them. Plus, they get to earn their sweet drinks. Rich, creamy white hot cocoa that’s made with peppermint kisses and white chocolate. Originally published on Will Cook For Smiles on December 5, 2013. Yum!!!! Lyuba, this looks so pretty and sounds wonderful! Pinned! Oh my I need this like NOW! Two great flavors blended together! Oh and the kids are adorable! Looks so yummy! I could take one right now! It is so cold here! This looks awesome! But I am a little confused – you have adding the chocolate chips at two points in the recipe. Am I supposed to divide the chips in half, or only add them at the end, or what? Thanks for getting me cleared up! Patricia..was this ever answered? I am confused to on the ‘chips’. I’m sorry, Patricia and Sandi for getting back to you so late! It certainly IS a misprint and I fixed it! We have had a cocoa tradition in our family for 23 years. Every night at 9pm it’s “cocoa time”. When my daughter was small we would enjoy it while she was in bed but she’s all grown up now and enjoys it with us. This recipe is gonna spice things up for us! Thanks for sharing! Yum! What a great combination of flavors! I’m featuring it today on my blog! Love this idea! It sounds so yummy! Oh, my that sounds good. I wish I had a big mug of that as I sit here at my computer!!! I wish I could bring it to you! Thank you, Jocelyn! Yummy!! 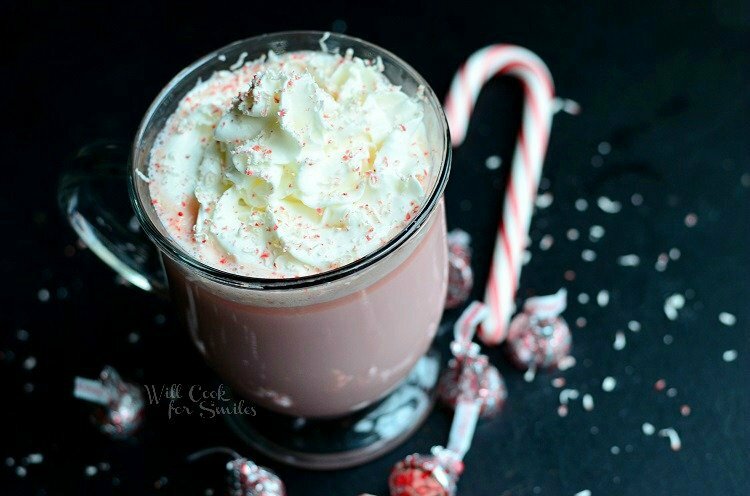 Hot cocoa is so nice to have this time of year – love the addition of peppermint! I made this for the Christmas Holiday. I could not find the Hershery’s Peppermint kisses. I used Wilton’s Candy Melts in Peppermint. The Cocca turn out great. I did find Hershery’s Mint Truffles and Made Dark Chocolate Cocca also and both were very delicious. Thank you so much, Jewel! So glad you liked it! 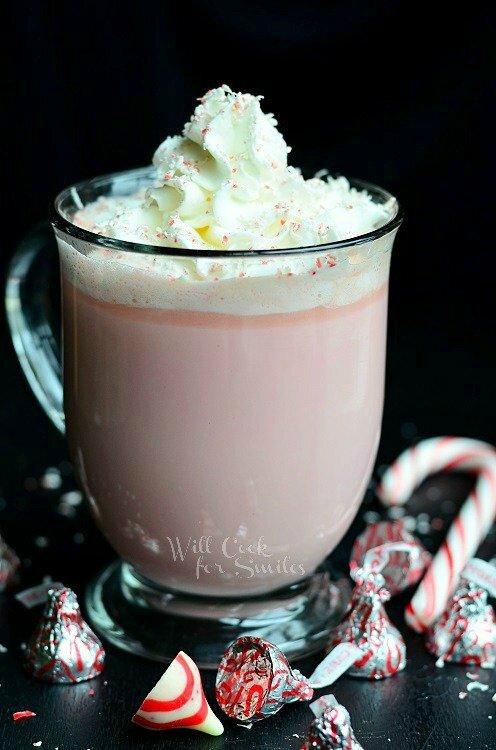 I JUST FOUND MY NEW FAVORITE PINK HOT CHOCOLATE RECIPE !!! THAT IS FANTASTIC !!! IT IS THE VICTORIAS SECRETS — OF ALL HOT CHOCOLATES !!! SO TASTEFULLY EXOTIC TO THE SENSES !!! I LOVE THE PRETTY PINK COLOR AND THE MOUND OF WHIPPED TOPPING ON TOP . WHAT A BEAUTIFUL PHOTO OF YOU TAKING A SIP FROM THE CUP ( WITH YOUR SON ). VERY PROFESSIONAL PHOTO . LOOKS LIKE A CHRISTMAS CARD PRETTY . THANK YOU FOR THE RECIPE !! Hahaha, you are too funny! Thank you so much for the sweet comment and the compliment, Lauren! So loving this as I have a caffeine allergy! No chocolate or coffee for me! My must have drink for winter has been Hot Spicy Apple Cider but I think it’s gonna be replaced! I’ve often thought about using white chocolate but wasn’t sure how that would work out!